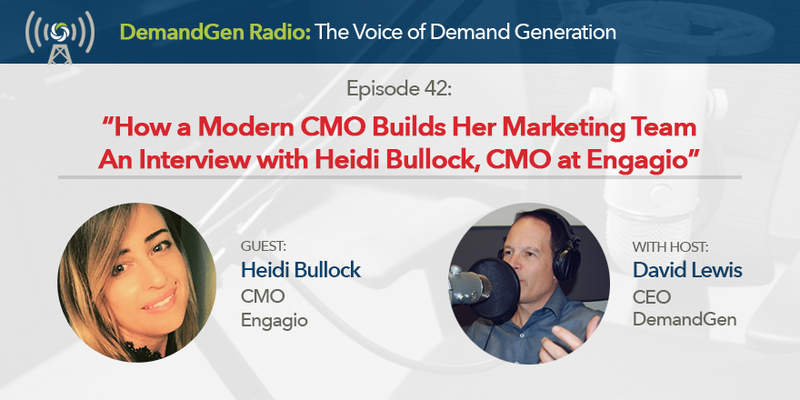 Heidi Bullock has spent the past 6 years building marketing teams at Marketo and now Engagio. In this episode, Heidi discusses her approach to defining roles and responsibilities and what it takes to create a high-performance marketing team. Heidi talks about how she shifted the traditional structure of a marketing organization and created a "hub of customer engagement." I share the framework of an Accountability Chart and how to use a "GWC" score card - a process we teach our clients for designing their organizations. We also cover how to incentivize marketing teams, share some critical roles that didn't exist a few years ago, and discuss the importance of being passionate about what you do. We wrap-up hearing Heidi's very prescriptive advice about what it takes, especially as a woman, to rise to the highest level of leadership. As a bonus, we close out on what it takes to define a new category for your product. This is a great episode, so don't miss it and be sure to share it if you like it.